Test your knowledge on manatee facts with Quiz 2! Greetings! This blog is a continuation on the rare and unique Florida manatee (yours truly). This is the second installment in a series of quizzes to test your awesome manatee knowledge! Just select your answer from each of the choices under the question, from A to D. You’ll find the answer key located at the bottom of this blog. OK – are you ready? Let’s go and Good Luck! Manatee vocalizations are described as chirps, whistles and _________. 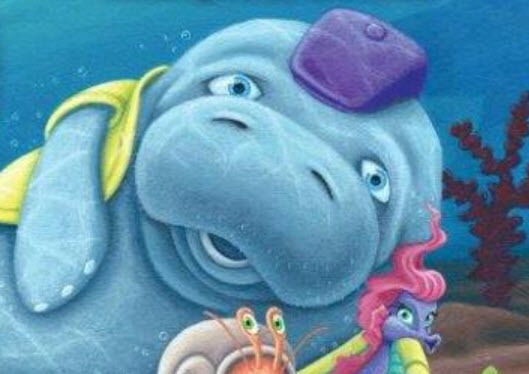 The manatee can be very ______________ about you. Manatees are also known as ___________________ . Manatees can actually tell the _______ of different objects. Manatees are very good at hearing _____frequencies and not nearly as good at hearing _____frequencies. Manatees are herbivores and eat ____ to ____ of their bodyweight every day! C. Squeaks – Manatee vocalizations are communications, especially between a mother and calf, when they are traveling or feeding in turbid water. The cow (female manatee) and her calf do a good amount of communicating. In fact, the cow can hear its calf’s squeaks and calls from up to 200 feet away! A. Marine Mammals – Manatees are marine mammals because they live completely in water (marine) and they breathe air (mammal). B.115 feet– Manatees have been known to respond to visual motion and cues from objects up to 115 feet away! A. – Manatees are very good at hearing high frequencies and not nearly as good at hearing low frequencies, which are usually associated with boat noise. This most likely explains why so many manatees are injured or killed in watercraft collisions each year. However, some good news here is that manatees most likely can hear the approach of propellers on boats, which have slowed down due to boat speed regulations in manatee zones. 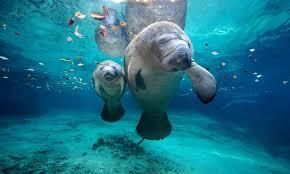 D. – Manatees eat 10% to 15% of their bodyweight every day! That means a 1,000-pound manatee will eat 100 to 150 pounds of plants each day. Their diet consists of submerged seagrass beds and also freshwater vegetation. Stay tuned for more manatee quizzes in my future blogs!